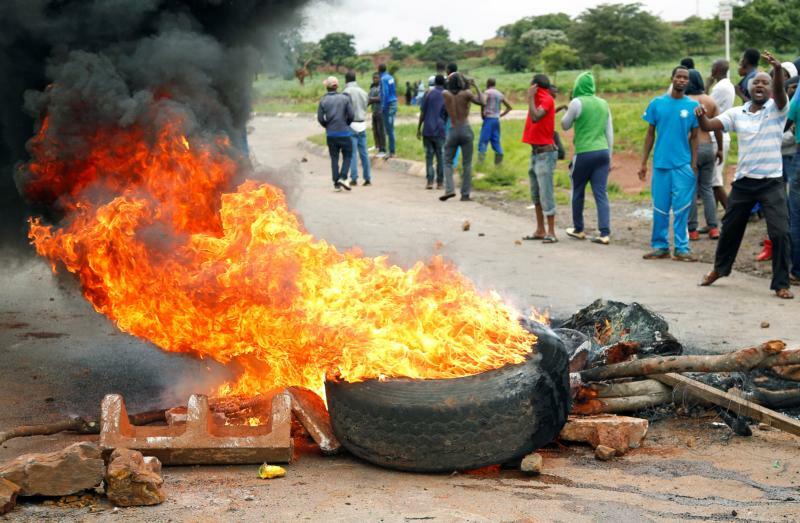 CAPE TOWN, South Africa (CNS) — After reports of multiple deaths in violent protests over steep fuel price hikes in Zimbabwe, Archbishop Robert Ndlovu of Harare called for restraint by the security forces and protesters. “Mature political leadership and a recognition of the need to work together for the common good” are essential, he said in a Jan. 16 telephone interview from Harare. Three people, including a police officer, died in Jan. 14 protests that followed President Emmerson Mnangagwa’s announcement of a more than 150 percent rise in the fuel price. “It’s difficult to get a full picture of what’s happening because the internet is still down and many people haven’t yet been able to return to work,” Archbishop Ndlovu said. Internet services were cut Jan. 15 as mobile networks in the southern African nation enforced a government internet shutdown. Catholics schools in Harare, Zimbabwe’s capital, were closed, along with most other schools in the country’s cities, “because of parents’ concerns for their children’s safety,” the archbishop said. Human Rights Watch said protesters burned a police station, barricaded roads and looted shops in Harare and Zimbabwe’s second city, Bulawayo. Security forces used guns and tear gas in response, it said. Amnesty International condemned the military crackdown and said at least 200 people had been arbitrarily detained. Soldiers and police were pulling people out of their homes and beating them, reports said. Zimbabwe has experienced an acute shortage of U.S. dollars, which has hampered imports and caused steep price rises. The U.S. currency was adopted in 2009 to combat hyperinflation. “Poverty is dire, especially in rural areas where people can’t access cash to buy food and other essentials,” Archbishop Ndlovu said. “With so many people in Zimbabwe’s cities unemployed, there is not much for people to send to family and friends in rural areas,” he said. Unemployment is above 80 percent in Zimbabwe. “The effects of price increases not only to fuel, but to basic goods and services such as health, education and food have made many people angry and desperate,” Zimbabwe’s Council of Churches said in a Jan. 14 statement. Many Zimbabweans accuse Mnangagwa of failing to keep pre-election pledges to improve the economy after long-ruling Robert Mugabe was forced out in a de facto coup in November 2017. “We are looking for ways to reach out to political leaders to get them around a table to dialogue,” he said. “Although the situation here is difficult, we have not lost hope,” he said. Problems include jobless youths being enticed to join demonstrations where looting occurs “as they have nothing to lose,” and greed and profiteering, Archbishop Ndlovu said.